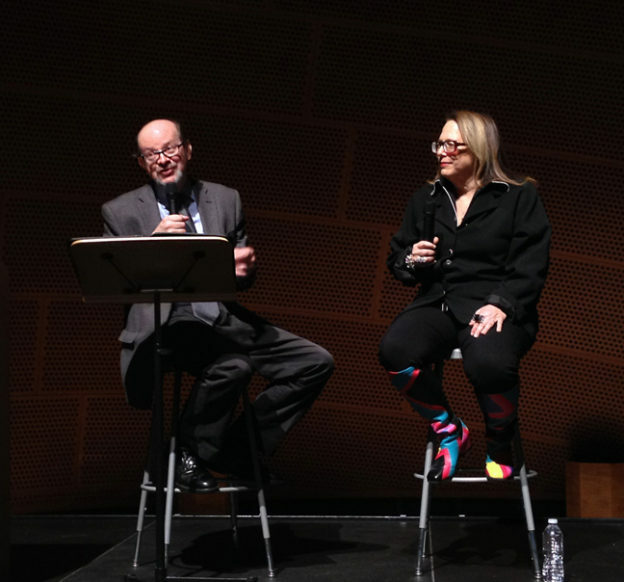 The music of On the Waterfront and Casablanca were the subject of “Upbeat Live” talks I moderated on Friday and Sunday prior to the Los Angeles Philharmonic’s first-ever live-to-picture concerts of both scores at Disney Hall. David Newman, who conducted both, was on hand to offer musical insights into the classic Leonard Bernstein and Max Steiner scores. On Friday we were also joined by composer Laura Karpman, and on Sunday our guest was composer Charles Bernstein. 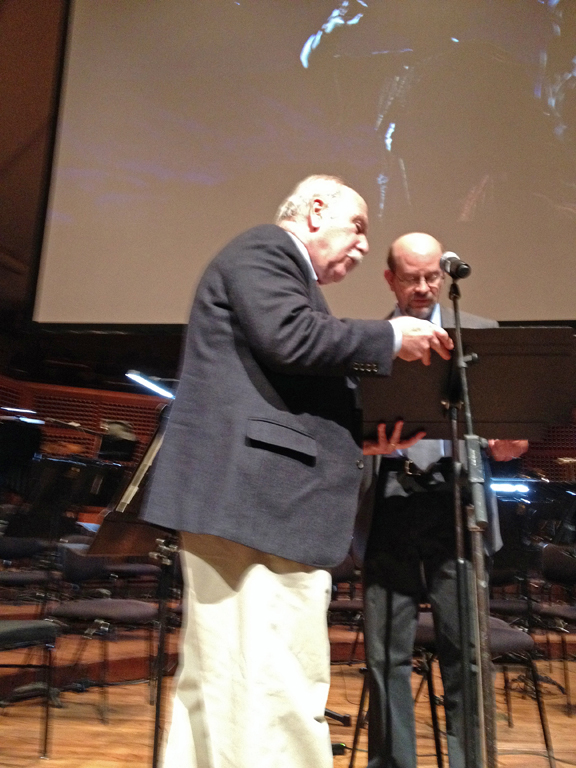 Both Karpman and Bernstein are current governors of the Academy of Motion Picture Arts & Sciences; this past weekend’s concerts marked the first of several events in the new three-year partnership of the Phil and the Academy. 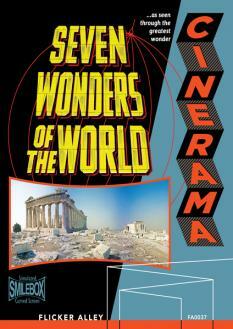 I also contributed the program notes for both films (Casablanca is here; On the Waterfront is here). This entry was posted in and tagged Academy of Motion Picture Arts & Sciences, Casablanca, Charles Bernstein, David Newman, Disney Concert Hall, Laura Karpman, Leonard Bernstein, Los Angeles Philharmonic, Max Steiner, On the Waterfront, Upbeat Live on November 21, 2016 by Jon Burlingame. Working with producer John Goberman during rehearsals at Davies Symphony Hall. 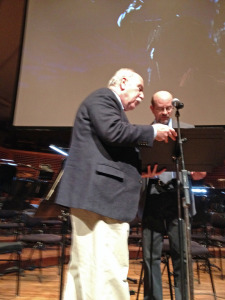 On Saturday, I was honored to host the San Francisco Symphony’s “Night at the Oscars” concert, which included excerpts — played “live to picture” — from classic film scores including Erich Wolfgang Korngold’s Adventures of Robin Hood, Max Steiner’s Gone With the Wind, Miklos Rozsa’s Ben-Hur, Bernard Herrmann’s Citizen Kane, and Harold Arlen and Herbert Stothart’s Wizard of Oz. It was great fun to share the podium with conductor Constantine Kitsopoulos and to work with legendary TV and concert producer John Goberman. We had some laughs and the audience really loved the music. We even got a nice review. This entry was posted in and tagged "Night at the Oscars", Bernard Herrmann, Constantine Kitsopoulos, Erich Wolfgang Korngold, Herbert Stothart, John Goberman, Max Steiner, San Francisco Symphony on February 16, 2014 by Jon Burlingame.